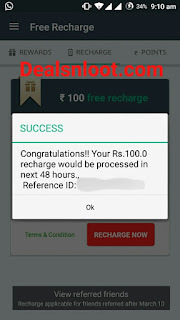 Hello Dealsnloot Readers,Via app offering Rs.100 free recharge for just referring 10 friends.Via.com App – Refer 5 Friends and Get Rs 100 Free Recharge. Jet set Go & add spice to your next trip by booking from best travel app. Amazing discount, cheap flight, bus, hotel, holiday & red hot offer & coupon, ease mytrip planning & travel booking for tour package only with VIA.com free android travel app.These 500 can be used for booking and you can earn 500 per refer also for booking.These booking money can be used only 5 to 12% of total amount.Grab This refer loot App and Get unlimited free Recharge. Recharge Update - They have change its Terms & conditions from referring 10 friends to Earn Rs 100 Free Recharge + You Friend must be keep the via.com App for 7 days to count as Valid referral + Recharge service is now manually and should be done within 48 hours.Also The Recharge Is Done Instantly.I am Already Free Recharge More Then 5 Time Using This App. How to get Via Points worth Rs 500 and Get Recharge ? Note - If you don’t download the app from above link, then you won’t get Rs 200 Joining Bonus. 2. Install & open the VIA.com App. 3. Now you will now see an option- “Get Rs 500 Bonus“, simply click on it. 4. Enter Invitee code 4577634 if its not filled automatically. 5. Now enter your Mobile number and verify it via OTP. 6. Login/Sign up with Facebook or Google+ or Via.com Sign up option. That’s it. You will soon receive Rs 500 discount voucher which can be used on your successive bookings. Simple Go to Menu>Refer & Earn. As per the new offer by ‘Via.com’. You will get Rs.100 every week for referring 5 friends or more. You also Get 500 Via Points per Referral. 1) You have to invite your friends to install and signup on VIA mobile application. 2) Minimum 10 new installs are required to be eligible for this offer. 3) Only referrals after march 10 will be applicable for recharge offer. 4) Once you claimed your recharge, your next recharge will be available after 7 days. 5) You and your friend will also earn points worth Rs 200 for each install. 6) All the other conditions mentioned in ‘Refer and Earn’ policy will remain same. First sign up via above process. Get your own referral code. Go to setting of your Mobile & Clear Data of Via app. Change imei or device id of your mobile. Now open the Via app. Enter your referral code, Mobile number, OTP. Click on Sign In with VIA then click on Sign up. Enter any fake details and any email id & sign up your account. Finally enter Email and password which you create. Finally your one referral completed. Repeat the process again and again. When you complete the 5 referral. Open main account & complete your Rs.100 Recharge. Now you can earn unlimited recharge from Via app. Download the Xposed DEVICE EMULATOR. Activate the Modules in Xposed Framework App. Now open the Device Emulator and mark all the options shown there. Change IMEI Number,Android ID,Advertisement ID,etc. There is no need to change any google ID's. That's it.Now just register with new number and email id. On Successful login you will get 500 Points in both of your accounts. Just complete 5 referrals from one account and Redeem your Free Mobile Recharges and Travelling Tickets. To Loot Unlimited , Just follow these steps again and again.